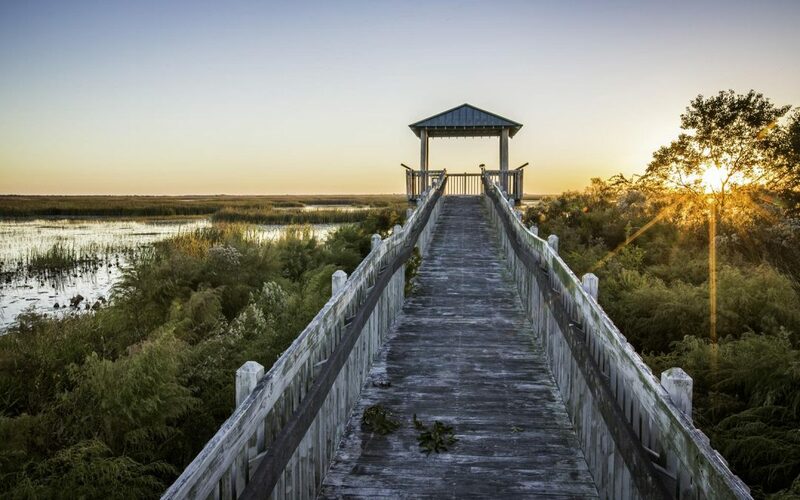 For true slices of Americana, few journeys in the Midwest can rival a road trip that retraces the path of our nation’s most storied highway. 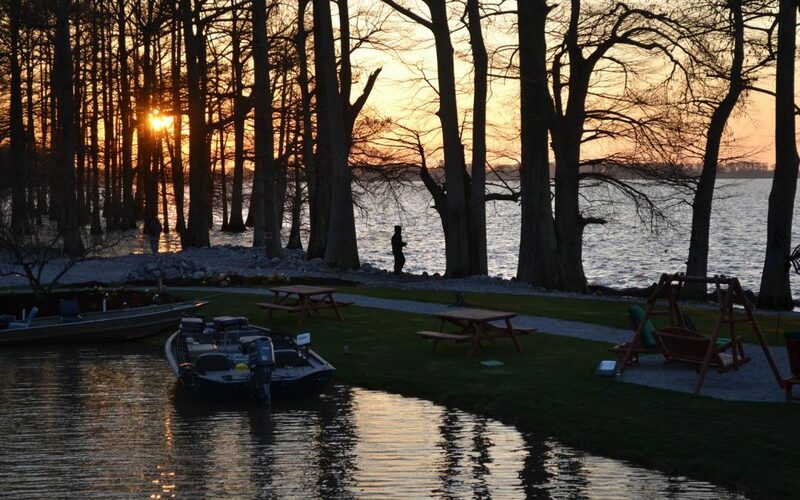 From the Lake Michigan shoreline of Chicago to the Mississippi River in Southern Illinois, museums, retro diners, doses of kitsch and other nods to yesteryear drive tourism on Route 66, fueling nostalgia for the heyday of automobile travel and a yearning for simpler times. It’s all about the romance of the open road. The fabled artery became known as the “Main Street of America.” Cozy motels, momand-pop cafes, filling stations, neon signs and roadside oddities were all part of its mystique. 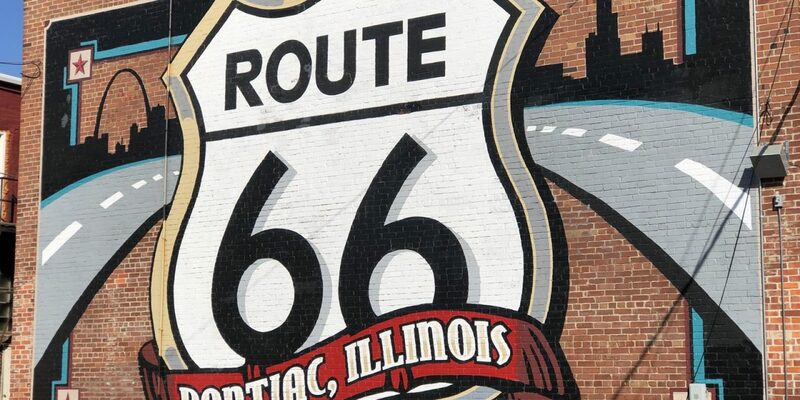 Reminders of Route 66 can be found in a number of Illinois communities, thanks to tourism offices and dedicated individuals who have put time, money and passion into preserving the highway’s heritage and keeping its spirit alive. As many original landmarks have vanished over the years, surviving treasures loom all the more special. 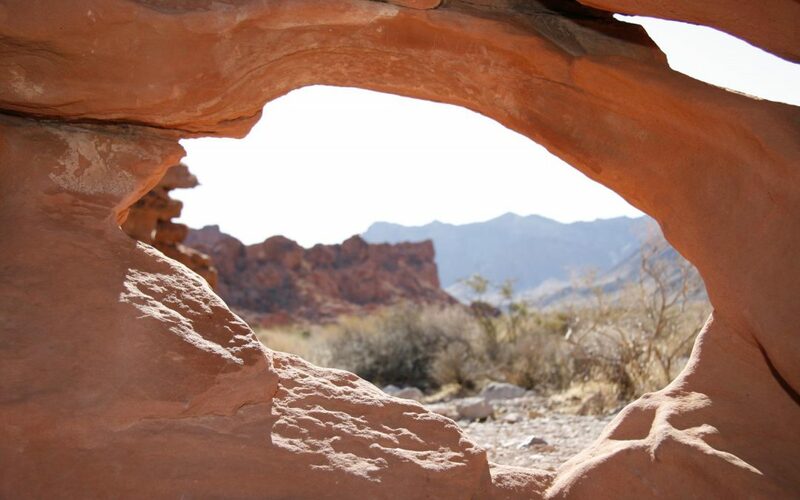 Stops at these attractions can complement any group tour, whether the itinerary theme is Route 66 or not. Parts of the original Mother Road are marked with “Historic Route 66” signs sporting the familiar shield logo. Most of Illinois 66, a 300-mile swath traversing the state’s agricultural heartland from Chicago to St. Louis, had been replaced by a superhighway, Interstate 55, by 1977. Many travelers got their first kicks on 66 at Lou Mitchell’s Restaurant, a diner on Chicago’s Jackson Boulevard, just west of the famed road’s starting point. “Serving the world’s finest coffee,” as its sign proclaims, the breakfast/lunch favorite has been dishing up comfort food since 1923. Lou’s continues the tradition of offering free homemade donutxes of Milk Duds to women and children who enter the restaurant. 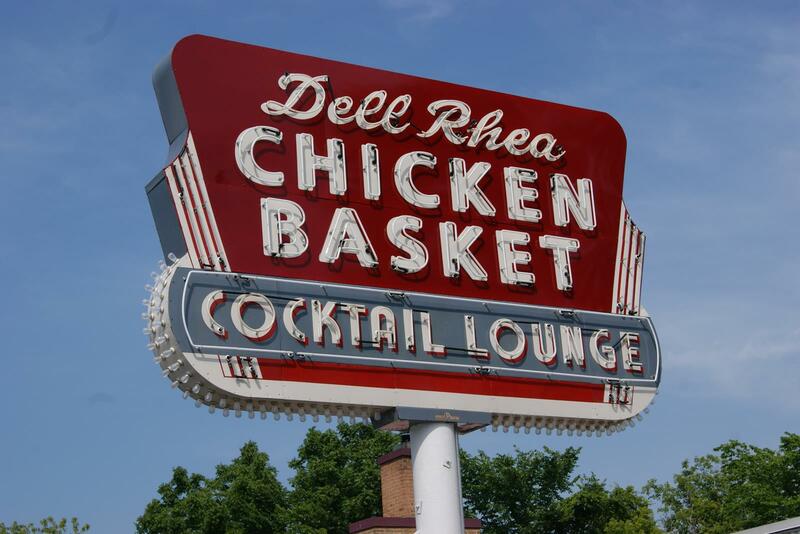 On the frontage road bordering I-55 in west suburban Willowbrook, another Route 66 dining icon survives—Dell Rhea’s Chicken Basket. Filled with Mother Road memorabilia, it has welcomed travelers since the 1940s and serves the best fried chicken anywhere. You can pile your plate with chicken, mashed potatoes, hushpuppies, pizza and more at the weekday lunch buffet. Others would argue that White Fence Farm, a Route 66 favorite still flourishing a few miles away in suburban Romeoville, has the finest fried chicken around. The city of Joliet, about an hour from Chicago, also trades on its Route 66 heritage. Start your exploration at Route 66 Park on Broadway, once a leg of the famed roadway. Browse the park’s informational kiosks and enjoy a cold treat at Rich & Creamy. 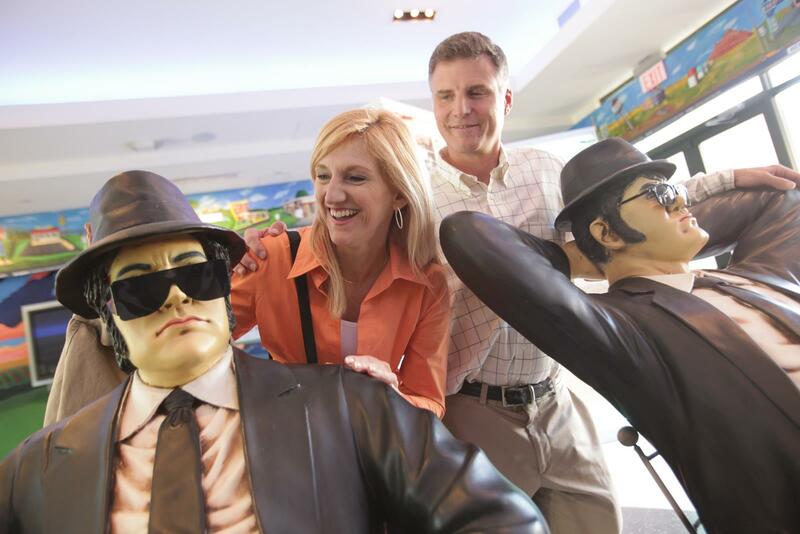 Atop the store are statues of Jake and Elwood Blues, characters in The Blues Brothers movie, which included scenes filmed at the Old Joliet Prison, visible from the hilltop park. Tours of the creepy, castle-like former penitentiary, a relic dating from 1858, are available. Downtown Joliet is home to the Route 66 Welcome Center, located within the Joliet Area Historical Museum (which arranges prison tours). 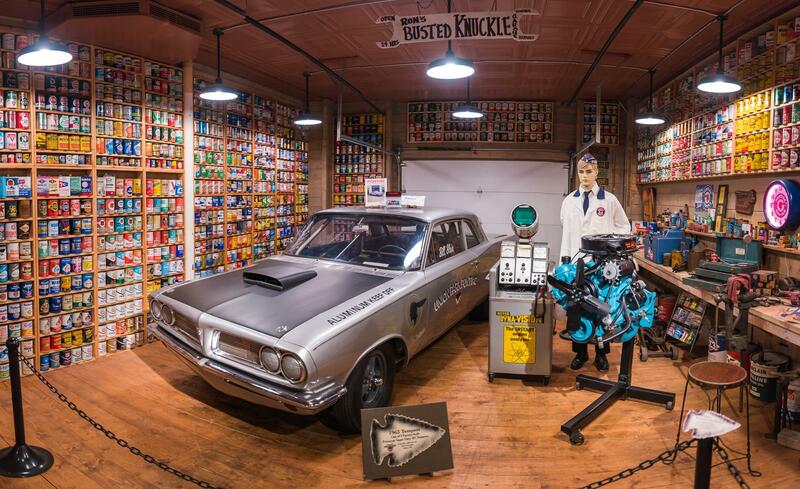 In Pontiac, Mother Road enthusiasts flock to the free-admission Illinois Route 66 Hall of Fame and Museum, a repository of memorabilia celebrating the people and businesses that served motorists on the historic highway. Its largest item of interest is the Volkswagen minivan used by itinerant hippie-era artist Bob Waldmire (1945-2009) for traveling up and down 66. His 1972 VW was the model for the character Fillmore in the Pixar/Disney film Cars. Outdoors, museum visitors pose for photos in front of the giant Route 66 shield mural emblazoning the back wall of the 1900 building, once Pontiac’s city hall and fire department. The setting is landscaped with bricks from the original Route 66 and a wishing well that stood at the Wishing Well Motel in Countryside, Illinois. Also on display is the converted 1966 school bus that Waldmire used as a mobile home/studio in Springfield. Buildings in downtown Pontiac are decorated with 23 other artist-designed murals, including four that recall Route 66, one a sunset scene showing a bright yellow late ’50s Chevy. Classic car buffs will find much to their liking at the Pontiac-Oakland Automobile Museum, a shiny showroom displaying vintage Pontiac-brand cars and some of the Pontiac Buggy Company’s high-end Oakland models produced in the late 1920s and early ’30s. Exhibits include a big oil can collection, old gas pumps, model car kits and promotional items mirroring the brand’s namesake, Chief Pontiac, a fabled warrior who fought the British in the Great Lakes region. The place of pilgrimage for Route 66 fans in Bloomington-Normal is Ryburn Place. 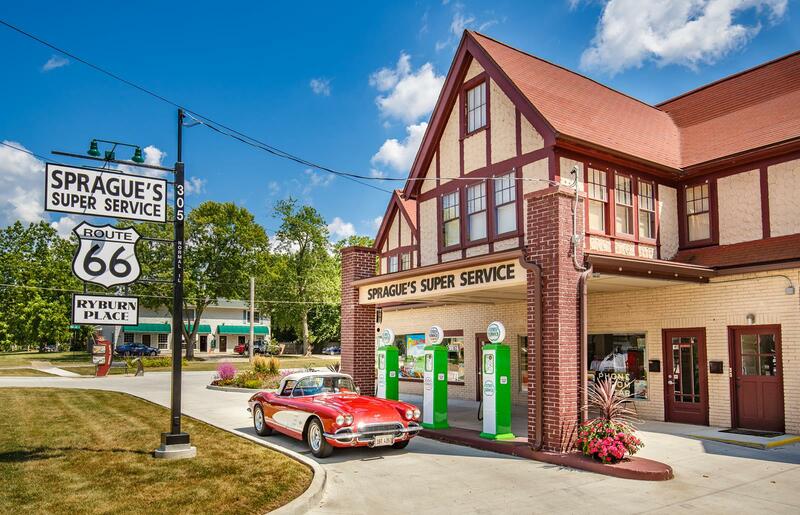 Formerly Sprague’s Super Service, the 1931 Tudor-Revival landmark survives as the largest of the few remaining two-story gas stations left on the old thoroughfare; the owner’s family and an attendant lived upstairs. 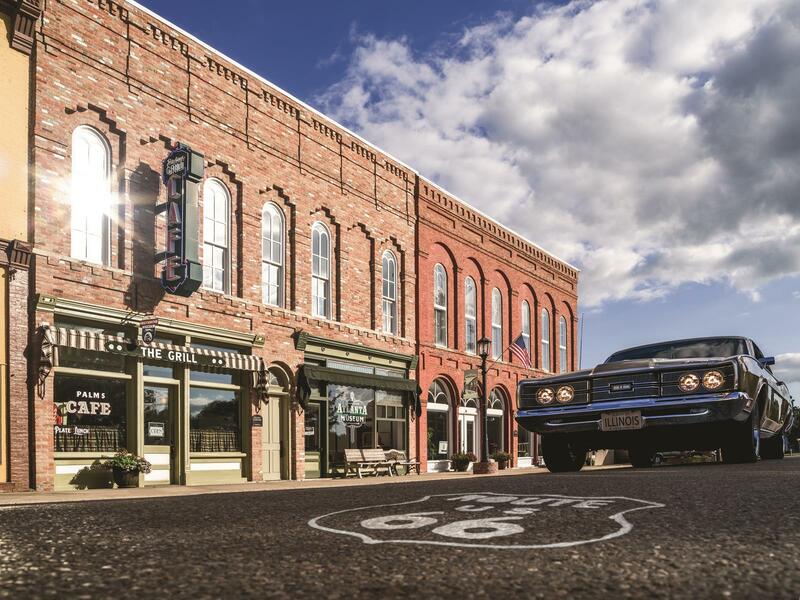 Happily for Route 66 diehards and casual tourists from around the world, the aging structure was rescued by Normal resident Terri Ryburn, who poured her heart and cash into restoring the Mother Road landmark. Her shop/travel information center, called Ryburn Place Gifts and Gab, opened for business in 2017, and the building is now owned by the City of Normal. She sells locally made arts and crafts as well as Route 66 items, old license plates and antique road signs. The word “Gab” comes in because Ryburn loves chatting with travelers who drop in to browse and pose for pictures by the replica Cities Service (later called Citgo) gas pumps. The last working pumps were removed in 1979, after which the location hosted other businesses. More Route 66-themed souvenirs, from earrings to bars of soap, are for sale at Bloomington’s Cruisin’ with Lincoln on 66 Visitors Center, which has attractive exhibit panels and videos promoting Bloomington-Normal’s connections to Abraham Lincoln and the Mother Road. Sharing downtown Bloomington’s old courthouse with the McLean County Museum of History, the center offers back-lit, billboard-style displays chronicling hotels, motor courts, tourist camps, gas stations and eateries that served Route 66 travelers. One panel tells how the Steak ’n Shake chain got its start in Normal in 1931. For a taste of the good old days just southwest of Bloomington-Normal on I-55, visit Dixie Truck Stop, which opened in 1928 and sold sandwiches to Route 66 travelers. Today it’s a full-fledged restaurant with plenty of seating for groups and a decor evoking early car culture. Nearby, the I-55 exit for Shirley, at the mid-point of Illinois Route 66, takes you to Funks Grove Maple Sirup. The family business dating back to 1824 sells its pure maple sirup (that’s how they spell it) and offers guided tours of the grounds during sirup-making season. Groups getting off I-55 in Atlanta, about 15 minutes from Shirley, can satisfy their hunger with comfort food and revisit yesteryear at the Palms Grill Cafe, a cheery restaurant that was restored in 2009 to its 1930s appearance. Each table has a small plastic palm tree, a motif chosen by the original owner, who wanted to evoke memories of sunny California. Fried chicken, meatloaf and homemade pies are menu favorites. A room in back is perfect for group meals. The town of Lincoln lays claim to The Mill on 66, a barn-red building that resembles a Dutch windmill. Opened in 2017 as a museum and gift shop after a decade of renovation, it first saw life in 1929 as the Blue Mill restaurant, a white building trimmed in blue and with a blue interior. New owners in the 1940s changed the Dutch motifs, painted the exterior red, and added a bar and dance hall. Known for its fried schnitzel, or pork tenderloin, The Mill closed its doors in 1996 and languished for years, a forgotten piece of history. 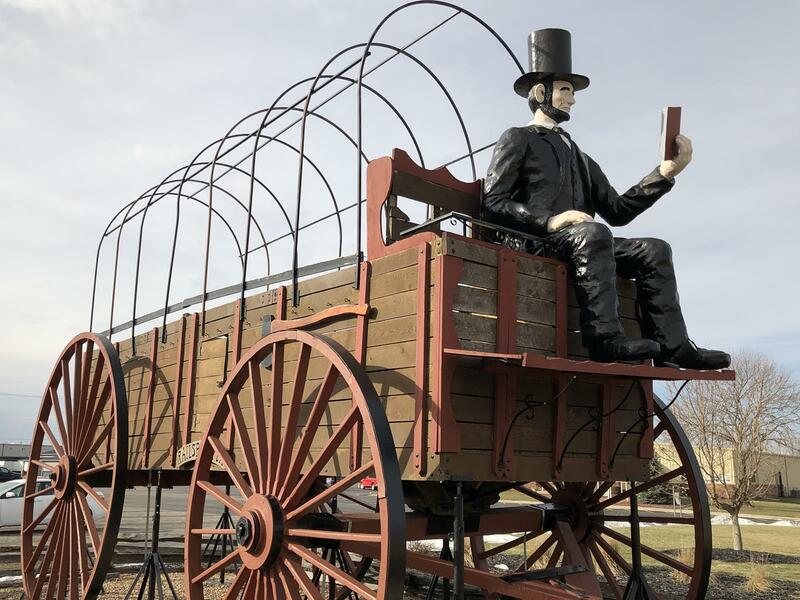 In the spirit of quirky attractions, Railsplitter Covered Wagon in Lincoln, recognized by the Guinness Book of World Records as the world’s largest covered wagon, sits on Old Route 66 in front of the Best Western Lincoln Inn. Measuring 40 feet long, 12 feet wide and 25 feet tall and surrounded by a split-rail fence, it features a seated Abraham Lincoln fiberglass figure reading a law book. Route 66 in Springfield has several sites that recall the highway’s golden era. The newest magnet delivering kicks on 66 is Motorheads Bar & Grill, a retro-style restaurant that opened in summer of 2018. A shrine to all things automotive, the cavernous space is festooned with old grilles, license plates, vintage advertising signs and lots of Route 66 shields. There are even whole cars and motorcycles on display under the soaring ceiling, which once sheltered a Stuckey’s, one in the chain of roadside stores famous for their pecan log rolls and teal blue roofs. A separate museum building has a party room ideal for groups and brims with Route 66 artifacts, many from the collection of the late Bill Shea, a Springfield icon who operate da gas station-museum. Motorheads serves up hearty fare like patty melts, pizza and horseshoes, the latter a Springfield specialty of Texas toast and choice of meat smothered in French fries and cheese sauce. Springfield’s best-known Route 66 standby is Cozy Dog Drive In, a fast-food joint packed with mementos, clippings and old signs. It was founded in the late 1940s by Ed Waldmire Jr. (father of traveling artist Bob Waldmire), who introduced the Cozy Dog, the name he gave his deep-fried corn dog on a stick. Large enough for bus groups, the eatery has an extensive menu that includes everything from breakfast items to BBQ sandwiches and pork tenderloin—in addition to those dogs bathed in Ed’s original special-recipe cornmeal batter. Many towns south of Springfield also have crowd-pleasers that pay homage to Route 66. 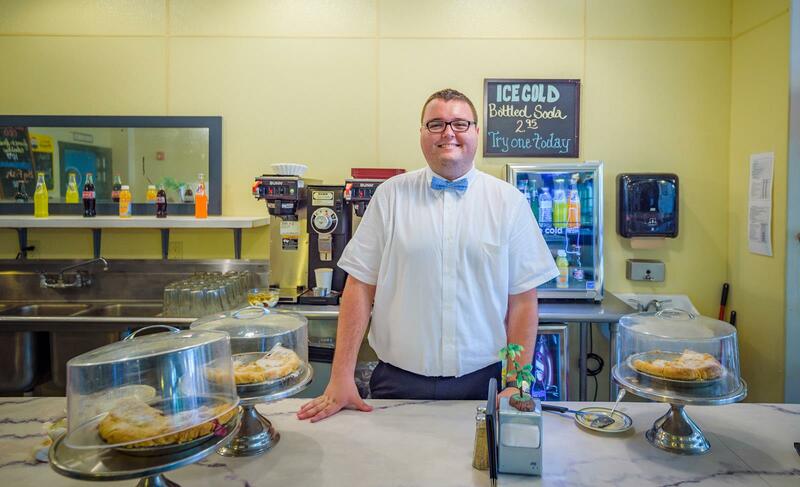 Litchfield takes pride in the Ariston Cafe, a fine restaurant going back to 1924. Or grab a bite at nearby Jubelt’s Bakery, a homey cafe on Old Route 66. 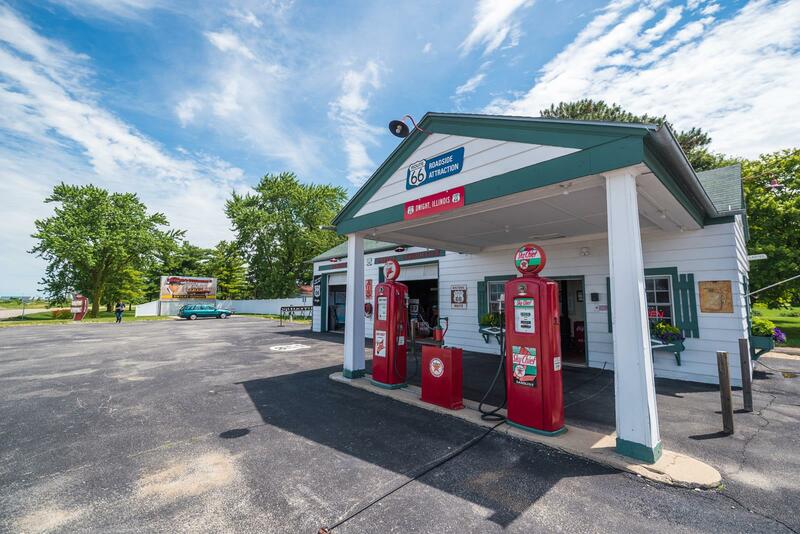 The neighboring Litchfield Museum and Route 66 Welcome Center, marked by the Vic Suhling Gas for Less Sign on its original site, salutes local businesses that flourished along the roadway. In Mount Olive, the sunshine-yellow gas pumps of the restored Soulsby’s Service Station make a great selfie backdrop. The oldest original filling station on Illinois Route 66 that has not been completely rebuilt, it dates back to 1926, the year the road opened. Henry’s Rabbit Ranch in Staunton, though it didn’t exist before the mid-1990s, maintains the traditions of the Mother Road with a curious mix that includes live rabbits in pens, Volkswagen Rabbits, and other car and truck memorabilia. In Livingston, a pink elephant visible from I-55, plus an ice cream cone-shaped building and other larger-thanlife sculptures, beckon wayfarers to explore Pink Elephant Antique Mall, housed in a former high school. For good eats with a side of nostalgia, stop for lunch at Doc’s Soda Fountain/Deck’s Pharmacy Museum in Girard or Weezy’s Route 66 Bar & Grill in Hamel, a mementofilled roadhouse that has been around under various names since the 1930s. History and architecture buffs will go crazy in Carlinville, notable for Carlinville Historic Square with its collection of specialty shops in painstakingly restored 19th century buildings. At the Mississippi River in Madison, the Chain of Rocks Bridge was built in 1929 as part of Route 66. Today it is one of the world’s longest bicycle and pedestrian bridges and is open for vehicular traffic during special events. From Illinois, Route 66 continued west across Missouri, Kansas, Oklahoma, Texas, New Mexico and Arizona before reaching Southern California and the Pacific shores of Santa Monica. 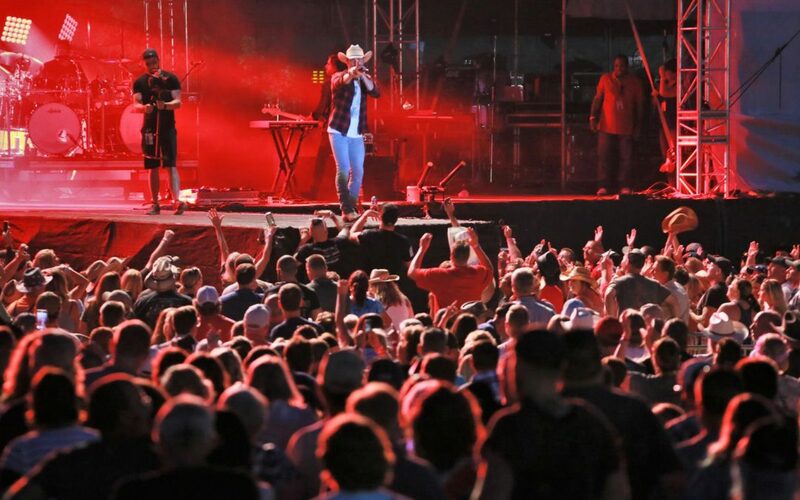 Encompassing the road’s easternmost leg and some of its most colorful sights, Illinois is truly the place for kicks on 66.